I got a note from a This is True reader and saw he had a very intriguing link in his email “signature” block, commonly referred to online as a “.sig” (with or without the period). Smart: that’s great real estate to briefly promote your site. The folks you exchange emails with are potential long-time readers or customers, so why wouldn’t you let them at least briefly know you have something to offer? Check your signature right now, before you continue! Do you have at least something in that space? His was intriguing enough that I clicked the link: it was a really good promo line (just nine words. I’m not going to repeat it since this article isn’t about promo lines, and I don’t want to identify him, but rather use the idea to help you). Anyway, his landing page is somewhat similar to mine, in that he uses a hover box as described in a recent article, but that’s all it is: there’s no opportunity to close it to get more information, as is the case with mine. You can click this (and the next one) to see them larger. What is he going to send? He mentions videos “and more” …but I don’t want to sit through videos without knowing anything else: text newsletters allow me to skim. Who is he, anyway? Is he an expert in his topic? I have no idea. Neither his sig nor his landing page gives me a clue. So is it any wonder whatever that I closed the landing page without subscribing? What’s the site about? Email, clearly. More specifically, “email marketing more effectively, cheaply, and ethically.” And if that’s not enough information, the reader has the ability to close the box and explore the site for both details and examples. What is he going to send? Brief newsletters. That’s why I call it “Emailified Briefs”: I’m setting the expectation that the newsletters will be short. Have interest in the topic presented in the mailing? Great: there’s a link to the full discussion. If not, it’s a simple matter to hit Delete and go on to the next item in your inbox. Quite a difference, yes? It’s still hard to get potential readers to give us access to their inbox, but I’ve made it clear what they’ll get, and answered most objections without reminding them of their cursed spam problem. Now, that reader with the intriguing sig promo is from my main list, not Emailified, but I told him that his landing page needed work, and that’s the kind of thing that Emailified covers. Hopefully, he was intrigued enough to check it out. And, of course, he can, since my sig already has a link for the site. Does yours? Being vague, either by accident or by design, to entice people to subscribe is a bad idea. 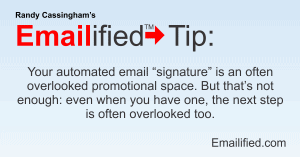 Once they start receiving the emails and realize what they’ve signed up for, they will likely ignore the emails repeatedly (trashing your open rate and disguising your actual audience reach), unsubscribe, or click the “report as spam” button (putting your ESP account and perhaps your domain name in jeopardy). Better to be honest and clear. 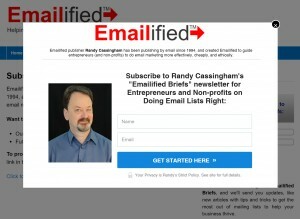 Build a list of interested and engaged subscribers instead of a pile of email addresses belonging to people who will never buy anything from you. Some organizations even remove subscribers who haven’t opened an email in a long time to avoid negative consequences from people who have forgotten they actually requested the email and regard the material as spam. Mike is very insightful here. And, in fact, I recommend all list owners periodically “clean” their list, and I’ll be going into the details of that soon.